When I first heard of Bravely Default, the name itself was enough to turn me off from the game. I remember having this thought like, “What is it with Square Enix and their obssession with strange, meaningless names? The words ‘bravely’ and ‘default’ make no sense together. Come on, SE…” Add onto it the fact that a fairy was somehow one of the main and important characters of the game and I definitely lost any interest I may have had in playing it. However after deciding to buy a 3DS for a completely different game I decided that as long as I had the console I may as well have put in the effort to expand my library past one game. After reading the seriously great reviews the game received on Amazon I decided to cave and get it. I admit that despite there being many things in the game that I didn’t really care for, I enjoyed it thoroughly. Negatives and all. 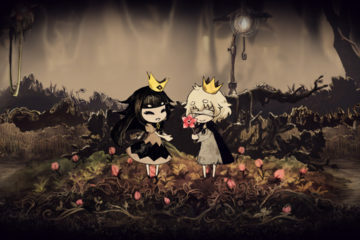 The story is one of the two strongest parts of the game, in my opinion. It’s hard to talk about the narrative of the game without spoiling anything, though, since so much happens plot wise. So I’ll just describe what I like without mentioning anything from the game specifically. 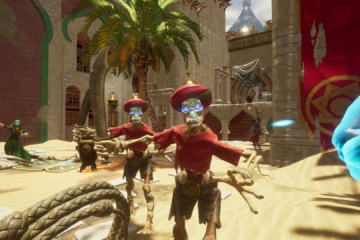 The four main characters in the game are all well made and well developed characters. I can’t think of one character who gets more special treatment and focus than any of the others once you get to the middle of the game and start making good headway on the plot. Even some of the side characters have interesting personalities and plot lines to themselves as well which is always nice to see. It’s also nice to see some female characters with actual backbone. 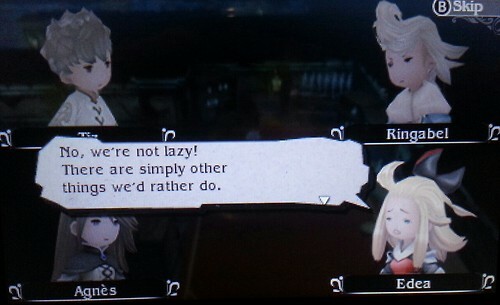 I’m specifically referring to Edea, a spunky girl with who has a loud mouth and strong opinions about the world. I found many of the interactions with her to be delightful, funny, sometimes crass, but over all really added to the scenes she was in. The main antagonist of the game is also extremely well done, in my opinion. Most video games make some bad guy that is completely removed from the game until the very end, but the end boss of this game has their hands in almost every single plot point in the game which is really clever and refreshing. It also makes the plot twists that happen in the game all the more shocking and powerful. The fighting system is the second strongest point of the game, despite it being turn based which is allegedly a system that the gamer community is tired of seeing. The job system allows you to pick several different classes for each character that all have their own distinct strengths and weaknesses. Every character can be any of the classes, however because of inherent stat differences not everyone is going to be best at every class. That doesn’t really limit the amount of class combinations you can have in a party, though. It’s also really fun to have an entire party of summoners or black magi and blaze through battles without any synergy. What’s really interesting and innovative about Bravely Default, however, specifically has two do with the two words in the title. In battle you have the option of using a Brave or a Default. It’s difficult to explain in detail without taking several paragraphs so simply put, every character and enemy has the ability to attack more than once per turn or pass on their turn and gain an extra one. By using a Brave, a character can choose to use up their next few turns and add it to the current one. This allows you the ability to end battles quickly by clumping all of your attacks in one go, but putting that character at a turn deficit. However, as you might expect, if you don’t finish off the enemy in that turn the character will be passing on all of the turns you used up until they’re back to having one turn again. There are even some attacks that use up more than one turn because of their powerful natures which adds an extra element of caution and planning when using them. A Default, however, is the exact opposite of a Brave. When a character defaults they’re essentially choosing to pass the current turn and switch into a defensive stance. When a character Defaults they take considerably less damage from all sources and gain an extra turn to use next time it’s their turn to attack. This leads to an interesting situation in the late game where strategically using spells and attacks has more of a place. Properly making use of Defaults to mitigate a powerful attack and store up extra turns to string together really powerful attacks is how the tougher boss encounters are fought. It’s this simple battle mechanic that really freshens up a seemingly old battle style like turn-based combat. This is one of the first times in a game where I felt like challenging fights were really fun, just because there were so many decisions I could make differently with each attempt at the boss. Every battle failure I had felt more like a flaw with my ideas than with the game itself which is indicative of a well crafted game. It’s also worth noting that the battle feature also has an auto-battle function. 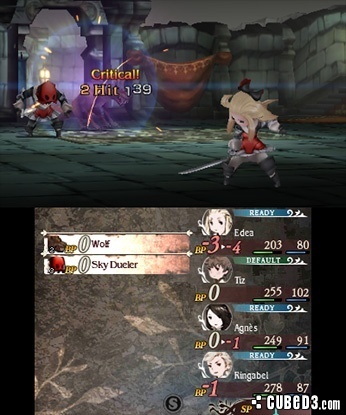 Bravely Default, being a JRPG, has a lot of points during the game where grinding levels on random encounters is the only way to get past the next boss fight. To avoid having people give up on the game because of this mind-numbing activity the designers implemented auto battle. If you’ve found there’s a particular combination of moves that can wipe out any monster you come across within a given area you can set the battle to auto and the characters will automatically repeat all of the moves they used in the previous battle in any new encounter. The battle will also be sped up so that you don’t have to spend much time watching how it unfolds. This can allow you to grind as much as you need to with minimal time spent and boredom acquired. A really unique and awesome feature that I feel every JRPG should emulate because seriously, grinding is just the worst. 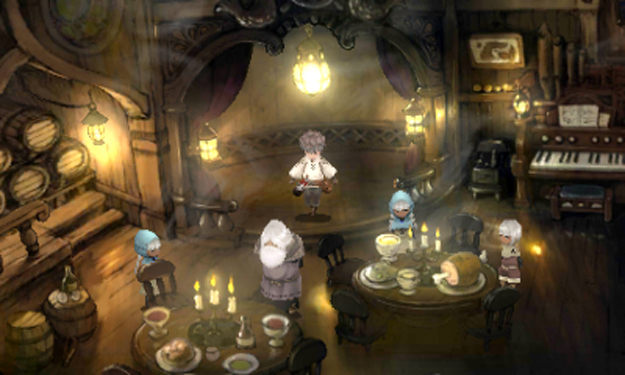 The graphics and design of the landscape in Bravely Default is unique and pleasant to look at. The game is incredibly colorful and the chibi form the characters take through the entire game wasn’t overbearing or annoying to look at. The aesthetics actually remind me a lot of Final Fantasy IX with its use of lighting and drawings for background features. All of the uniforms the different jobs wear, while fitting under a standard theme (red mage in red clothing with a rose, time mage with clock themed elements on the armor), are unique on each character that wears them. The animations for the attacks and special moves were really smooth and cool to look at, as were the spell effects. Over all if you can get past the anime elements and chibi style of the characters you have a very beautiful game in your hands. The game’s music is very well made and great to listen to while you’re playing. The music in the towns and dungeons are calming and beautifully composed with string and orchestral instruments, while the battle themes contrast greatly by incorporating heavy driving beats and electric guitars. Over all it’s like the game is played around in classic Final Fantasy music while the battles are done at a rock concert. It’s pretty fun and an interesting change. I will say, however, that the music is somewhat forgettable. It’s been months since I beat the game and I can’t recall a single musical track nor did I ever feel compelled to buy the OST. Going through on YouTube I can remember most of which songs played when and where, and while one or two battle themes make me feel kind of nostalgic for the game, I can’t say it thrills me like the Kingdom Hearts or Transistor soundtracks do. I’m going to be honest and say that my biggest gripe with the game came towards the ending. To avoid spoilers I’m just going to say…something happens in the story where you end up having the option of fighting battles you fought before, optionally I should add, or just skipping ahead to the boss battle that will advance the plot. The problem is the story presents these repeat battles as promising interesting plot development with great EXP rewards and bigger challenges than the last time you did the encounters. In essence they almost feel mandatory for a completionist like me. The issue isn’t that the game makes you repeat these fights, and there are MANY of them, it’s that it makes you repeat them multiple times without any direct hint as to when the repetition will stop. The repeat happened so many times, in fact, that there was a point where I had to put the game down because my frustration of needing to complete everything was completely interfering with my fun of the game. By the time I had reached the final boss I wasn’t exactly excited that I was finishing the game. I just felt relief that I had broken the loop of seemingly endless battles. I feel like this part of the game didn’t need to be stretched out as long as it was. It left such an impression on me that if any of my friends pick up the game later or if I lend my copy to someone I feel compelled to warn them about it and offer my emotional support. “There’s going to be this part late in the game where you’re going to get really annoyed. Call me when that happens.” It was an interesting mechanic, I just think it was stretched out for too long. Long enough to sour my positive experience with it. However, if a game only has one major gripe I think it’s safe to say that’s a pretty good sign, wouldn’t you agree? This has been Roderick and thank you for taking the time to read this review on BitCultures. Looking forward to writing more for you in the future! Until then stay cool, beautiful people.